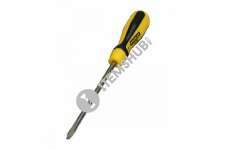 This reliable Screwdriver Phillips Cushion Grip of PH2 x 200mm is the correct screwdriver to use for repairing phones, laptops or even gaming consoles. 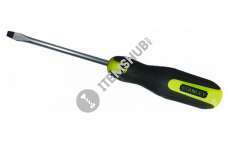 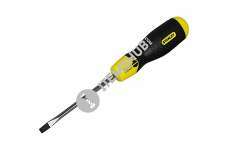 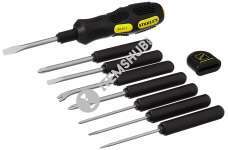 The screwdriver has a magnetic point that preven.. 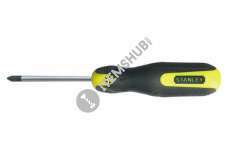 Brand: StanleyD (mm): 32.2L1 (mm): 200L2 (mm): 232.2Tip Size: PH2..
Stanley Cushion Grip Flared Screwdrivers, The cushion grip flared screwdrivers from Stanley have a large diameter handle to give you a comfortable grip and provides excellent torque. 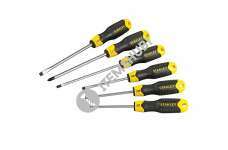 The screwdrivers .. 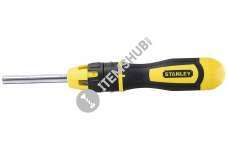 The Stanley Cushion Grip Flat tipped screwdrivers have a chrome plated bar which is corrosion resistant and magnetic tips for easy pick up and screw locator. 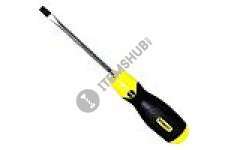 The soft grip handle provides excellent to.. 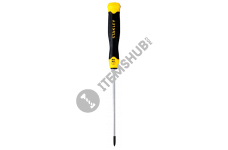 Improved ergonomic design for maximum grip and torqueErgonomically designed for maximum comfort and greater torqueChrome vanadium blade with tough hardened black oxide tipsNickel platted bar for corro.. The fatmax phillips tip screwdrivers have a chrome vanadium steel bar which allows high torque and reduces the risk of tip breakage, and the handle is moulded directly to the shaft for a virtually unb..
A screwdriver is a tool, manual or powered, for screwing and unscrewing (inserting and removing) screws. 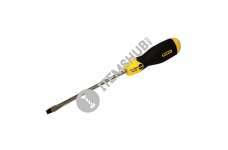 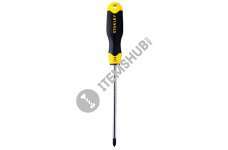 A typical simple screwdriver has a handle and a shaft, ending in a tip the user puts into the s..